What makes iGOTHAM lenses better? 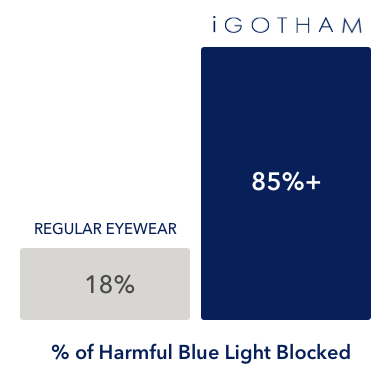 iGOTHAM Blue Light Blocking Lenses combat digital eye fatigue, strain, and headaches, protecting your vision from the harmful blue light rays emitted by computer and smartphone screens. Compared to other antiblue light blocking glasses, iGOTHAM lenses block more than 2x blue light. Best of all, instead of using cheaper, yellow-tinted lenses, iGOTHAM lenses are fully transparent and clear. We also manufacture our products in the United States, giving you only the best quality lenses at a fair price.